Coven is a American rock band formed in the late 1960s, composed of vocalist Jinx Dawson, bassist Oz Osborne (not to be confused with Ozzy Osbourne of Black Sabbath), Chris Neilsen on guitar, Rick Durrett and later John Hobbs on keyboards, and drummer Steve Ross. They are recognized as being the band that first introduced the "Sign of the Horns" to rock and pop culture (as seen on their 1969 debut album release Witchcraft). They were signed to Mercury Records, where they put out their first album, Witchcraft Destroys Minds & Reaps Souls in 1969. 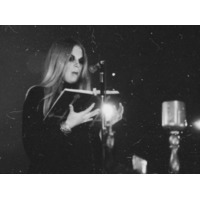 The music on the album was considered underground rock; what made it distinctive was the heavy emphasis on diabolical subject matter, including songs such as "The White Witch of Rose Hall" (based on the story of Annie Palmer), "For Unlawful Carnal Knowledge", and "Dignitaries of Hell". The album concluded with a 13 minute track of chanting and Satanic prayers called "Satanic Mass" (written by their producer, Bill Traut, of Dunwich Productions). Also included inside the album, was Coven's infamous Black Mass poster, showing members of the group displaying the sign of the horns as they prepared for a Satanic ritual over the naked altar. Luck returned to Dawson when Tom Laughlin asked her to record the "One Tin Soldier" song for his Billy Jack movie. It was written by Dennis Lambert and Brian Potter, and originally released in 1969 by the Canadian group The Original Caste (#34). Coven's recording charted three times, first in 1971 (#26), in 1973 (#79), and a re-entry of the original version in 1974 (#73) on the Billboard Hot 100, and was a top 10 hit in the Cash Box chart. The song was named #1 Most Requested Song in 1971 and 1973 by American Radio Broadcasters. Coven released a self-titled album in 1972 which featured "One Tin Soldier" along with "Nightengale" penned by Dawson, which charted as a hot pick on Billboard & Cashbox; a third album, Blood on the Snow, was put out on Buddah Records in 1974. One of the first music videos ever made directly for an album title song was produced by Disney Studios. In 1990 Coven appeared in the film Heaven Can Help with Dawson in a starring role. She wrote all the music and, along with original drummer Steve Ross, new members were added to the Coven which appeared in the film. On November 5, 2007, Dawson announced via her MySpace page that three of the original Coven members were planning to reform the group and record a new studio album to "finish what they started". She added that the band were "dying to tour". In May 2008, Coven released a new CD, Metal Goth Queen~Out of the Vault with music spanning decades. Some of the guest musicians on this CD included Michael Monarch, formerly of Steppenwolf, Glenn Cornick, formerly of Jethro Tull and Tommy Bolin, formerly of Deep Purple, in some of his last recordings.